Our large, one bedroom condo is located in the most desirable bungalows with a view of the ocean and lagoon from the living room and patio. The bedroom has a view of a greenbelt with flowing stream, lush landscaping etc. The kitchen is fully equipped with all new major appliances, granite counters, and includes a microwave oven, blender, toaster, waffle iron, coffee maker etc. It also has a reverse osmosis unit to filter the drinking water and the ice cubes in the refrigerator. The bedroom has a king-sized bed for a great nights sleep. We have 2 smart TVs, one in the living room and one in the bedroom. Linens including sheets, blankets, towels etc. are provided. We have beach chairs and beach towels available for your use. You can enjoy watching the sun go down over the ocean from the patio while BBQing your dinner or if you prefer you can just sip a glass of wine while enjoying the evening sky and watching the many birds in the adjacent lagoon. This is a great romantic getaway for 2. Amenities: North Coast Village is a beautifully maintained luxury condo complex right on a long, wide, clean sandy beach. The resort is on 12 acres and includes 2 large swimming pools, rock grotto spa, men's and women's saunas, pool tables, ping pong table, a complete exercise room with a variety of work out machines, grounds with lush tropical landscaping with a waterfall and streams, koi pond, underground parking, and a 24 hour security staff. Within walking distance are restaurants, a movie theater and miscellaneous shops in the village. Adjacent to the north is the Oceanside harbor with a variety of shops, restaurants, and coffee houses, along with boats for hire for deep sea fishing or whale watching, and jet ski rentals, etc. Within a one half hour drive is the famous Wild Animal Park, San Diego Zoo, Legoland and Sea World. Area: This unit is a bungalow unit which has its own individual entrance. You do not have to go down a hall for access. It is only a few steps from the sand. Fully stocked with coffee maker, blender, waffle iron, toaster, and all other miscellaneous kitchen utensils, kettles, frying pans. etc. Near restaurants, shops in harbor and other attractions such as Legoland, golf courses etc. We have stayed in many different condos at Northcoast Village and this was the best so far. The condo is very comfortable and very clean. The remodel work is first class. The view of the ocean and harbor is wonderful. The hosts Don and Jean are great to work with. The little extras were a nice touch. I recommend this condo if you are looking for a place in the area. 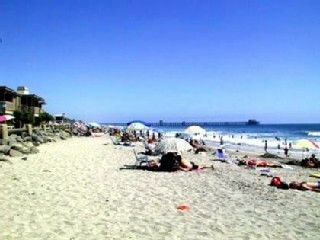 This location is right on the ocean and next to the harbor which has restaurants, shops and water sport gear rental.